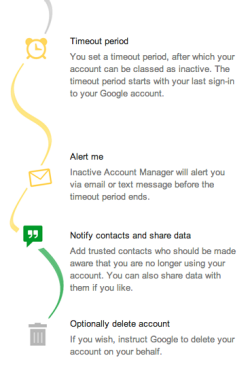 Google death: Inactive account manager lets you plan digital afterlife. Have You Written Your Google Will? A new Google feature gives you options for what should happen to your accounts after you’re gone. The feature allows you to have your account deleted after it has been inactive for a specified amount of time, from three months to a year. That will wipe clean your YouTube videos, Google+ posts, Google Drive files, emails, and all the rest. Or you can have the data sent to one or more trusted relatives or friends. Before that happens, though, Google will try to contact you via text message and secondary email to make sure you aren’t just hibernating. Google has more on the new feature in a blog post, and you can set it up for yourself here. Alternatively, you can sit back and hope that Google’s new director of engineering turns out to be right about the singularity.